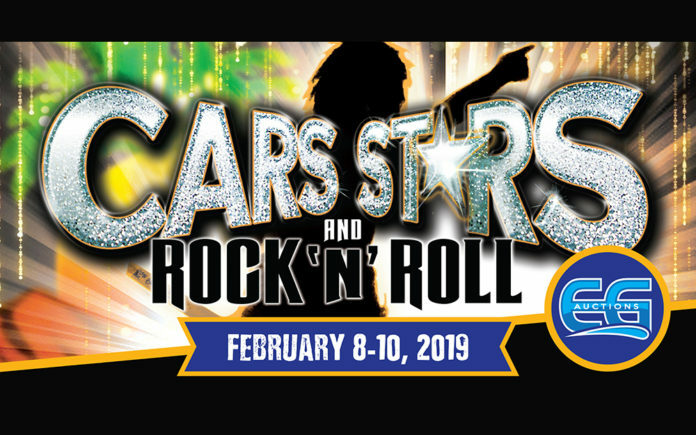 On February 8-10, 2019 Big Rock Golf and Pub at Indian Springs is teaming up with EG Auctions once again to present Cars Stars & Rock ‘N’ Roll, Spring Edition 2019. This will be another 3 day, outdoor festival that will include classic and specialty car auctions, a no reserve car and rock and roll memorabilia auction, and live music on indoor and outdoor stages. Live on a custom built outdoor stage, beginning Friday night, Mirage – A vision of Fleetwood Mac tribute will show why AXS TV has celebrated them as the “World’s Best Fleetwood Mac Tribute Band.” They’ll be followed by Manuel The Band, an award winning Long Beach based band, that will soon be on their way to even bigger stages. On Saturday night “Noise Pollution,” an AC/DC Tribute band will blow your mind, as this band brings you all the hits from both Bon and Brian Era. With the amazing Angus and Brian look and sound a likes, this is the best of ACDC. Inside the Big Rock Pub, Laurie Morvan and her bluesey band will take the stage. Morvan is described as a “Stunning California axe slinger…exhilarating electric blues guitar style,” by Modern Guitars Magazine. Sunday will finish big with Desert Rhythm Project on the outdoor stage. This award winning band blends reggae, rock, funk and hip hop flawlessly with their memorable original tunes. Regulars at the Joshua Tree Music Festival, this band will have you partying on the lawn until the sun goes down. For the grand finale, Steve Connolly takes the indoor stage at 7 pm, performing an Elvis tribute in The Spirit Of The King. All weekend you’ll find a full lineup of live music and entertainment both inside and out of Big Rock Pub. What about Golf? Not only will the golf course remain open during the event, but a Special client offer of $99 for a round (18 Holes) will be offered by Big Rock Golf & Pub. This special offer also includes a 3 Day Event Pass. Where’s the event happening? Cars Stars & Rock ’N’ Roll will be held at Big Rock Golf & Pub at Indian Springs Golf Course located at 79940 Westward Ho Drive, Indio, California, 92201 (corner of Jefferson Street and Westward Ho Drive). What about community support? Always conscious of their local community, a portion of the proceeds are going to the worthy community non-profit organization, Desert Cancer Foundation. What about tickets? General Admission $10 per day or a 3 Day Pass for $25 Get your tickets online at www.thebigrockpub.com, or at the door. EG Auctions, established in 1999, is the largest Collector Car Auction Company in Canada having conducted over 50 Collector Car auction events since its inception. It is also one of the largest online Collector Car marketing companies, having sold Classic Cars to over 120 countries worldwide and is widely recognized for showcasing some of the finest classic cars in the industry. Its business motto is simple, providing the highest level of service to its buyers and sellers. Currently based in the Coachella Valley, EG Auctions has had a presence in the Southwestern U.S. car industry for over 20 years. Its founders are passionate car enthusiasts who have restored and built some of the most iconic muscle cars in the marketplace. They are also official licensed builders of the Gone In 60 Seconds movie car – the Eleanor Fastback. Big Rock Golf and Pub at Indian Springs is a Rock and Roll themed gastro pub and live music venue that overlooks the 18th hole of its tournament speed, perfect 18 greens. In the two years since it opened its doors, Big Rock Pub has received several nominations and wins for Restaurant of the Year 2017, Best Live Music Venue, Best Sports Bar, and more. With over 100 autographed memorabilia art pieces adorning its walls, including an authentic Jimmy Hendrix display, Big Rock Golf and Pub is a place you have to experience to believe.